Our friends over at Activision, the fine folks who bring you the "Guitar Hero" games, noticed a small hole in the Metalli-tour schedule in between Australian dates and rang us up to invite us to the launch of their next "Call of Duty" game, "Black Ops." One thing led to another and next thing we know, we're playing at the party!!! Kinda like that top secret (yeah, right!) show we did in Austin at the South By Southwest Music Festival when our "Guitar Hero" game was released in March of 2009. The end result is that on this Thursday, November 4, we'll be in Santa Monica, CA rockin' at the Santa Monica airport, Hangar 8. 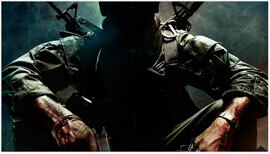 In addition to celebrating the release of "Call of Duty: Black Ops," the event will raise funds for The Call of Duty Endowment, a non-profit organization that helps soldiers transition to civilian life and assists them in establishing jobs and careers. Tickets will not go on sale, but we have a limited number of passes for Fan Club members to attend. If you're a Met Club member and will be in the L.A. area in a few days, head over to www.metclub.com to find out how you can win a pair of tickets. A big thanks to the Activision staff for inviting us as we sneak one more show in before the World Magnetic tour ends in Australia.